I caught up with Andrew Hardy on a flying visit to Glasgow, when we grabbed some lunch in the Ubiquitous Chip restaurant after he’d delivered a little tutored tasting to staff of Oddbins branches in the area. Andrew is indeed a member of the famous Hardy’s dynasty, but learned his trade working for Brian Croser at Petaluma, starting with the 1983 vintage as cellar-hand, then trainee winemaker and finally Winemaker and Viticulturist. 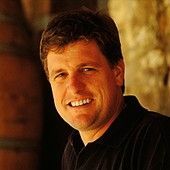 In September 1995 he accepted the position of Manager and Winemaker for Knappstein. Knappstein is based in the Clare Valley, an area much in vogue for its Rieslings, and much in the news after the leading estates there unanimously switched to screwcap closures in 2001. Knappstein make Riesling of course, along with other aromatic whites including Gewürztraminer, Semillon and Sauvignon Blanc. There’s Chardonnay too, and reds are based on Shiraz (including a new sparkling version) and Cabernet Sauvignon. Knappstein’s premium range appears under the “Enterprise” label. As part of the “Clare Valley Movement”, Knappstein bottle their Rieslingunder Stelvin (screwcap) rather than natural cork. Andrew says that at homethis no longer causes any stir at all, even in the poshest restaurants. Hebelieves Riesling-lovers to be a fairly fanatical breed however, saying “some peoplejust want a bottle of white, and 90% buy Chardonnay – but some want a bottle or Riesling, and they buy Riesling”, suggesting a very clued-up fan-basewho won’t query a screwcap. In fact, parts of all the Knappstein productionis now being bottled in Stelvin, depending on the market for which it isdestined. Andrew cites Asia and one or two pockets of the domestic market as being resistant to change for now. Like many of Australia’s smaller, but well-known producers, Knappstein is nolonger independent. Tim Knappstein sold up to Brian Croser of Petaluma fame in 1992, and then the latter was itself bought-out by the giant Lion-Nathanbrewing group in 2000. Today each winemaker in the subsidiary companies isgiven considerable autonomy, though all still report to Croser astheir “line-manager” in the winemaking chain. Andrew Hardy is considered bymany to be one of Australia’s most talented winemakers. Shortly after ourmeeting, another famous Aussie winemaker told me he consider Andrew to bethe country’s great unsung winemaking hero. Andrew’s forebears planted in the Clare Valley generations ago, with a hugearray of grapes to make a huge array of wines, from sparkling to “Port”.Now he says the Clare is focused on matching slope to grape much moreclosely. Riesling is their main focus, but coming up fast is Shiraz.Although Clare has sub-regions (like Watervale), producers are making aconcerted effort to improve and establish the Clare geographical region asthe highest quality in its own right. “It’s all about regionality; the£2.99 wines pull in their fruit from Riverina, but we are focusing onspecific plots and putting a lot of work into matching them to vines. Clare Valley is a premium area, for wines that express real regionality”. One of the wines we tasted with a good lunch wasa new wine, the “Chainsaw” Sparkling Shiraz. Andrew explained it is namedafter the cruel fate of the vines: the vineyard was originally planted in the 1960’s,but the vines were chainsawed back to stumps to be grafted to Chardonnay inthe 1980’s boom. Then as Chardonnay waned in the 90’s, the chainsaws were fired-up again tore-graft to Shiraz. The wine uses a little vintage “Port” as thedosage, to give it some extra oomph. Beautifully clean, limpid lime fruit with crisp minerality beneath. On thepalate quite round and waxy, with a lemon-zest quality. It is quitefull-bodied and lush, with a fine, distinctive citrus finish and lovelypurity. Very nicely structured and concentrated. Would age well. Very goodindeed. Oddbins, Frenmart, The Wine Press, Upton Wines, Gordon of Bolton, Peckham’s; £6.99. Full malolactic fermentation and French oak ageing gives this wine a mellow,toasty, invitingly warm nose underpinning sweet red berry fruit and spice.Warm, ripe and full-bodied, there’s a soft tannic background and just abackground support of oak. Nicely-weighted and savoury, this has good length.Very good. Oddbins, Safeway, Frenmart, The Wine Press; £8.99. 24-months ageing in French oak barriques gives class and sophistication, butthat saturated colour and huge, mulberry, eucalyptus and intensely mintynose is pure Aussie at its best. There is also plenty of cassis andblackberry fruit, and a super-ripe concentration. On the palate it is reallyquite crisp thanks to a little tannic structure and a toasty background ofoak, with a lovely quality of sweet fruit and medium- to full-body. Pure andlong, this finishes with lots of style. Excellent. Oddbins Fine Wine, Majestic, Frenmart, The Wine Press; £13.99. Huge, lush, chocolaty nose, flooded with blueberry and blackcurrant fruit.Fine weight on the palate, with a persistent mousse and lovely purity ofdense, earthy, black fruit flavours. Stays creamy and full through themid-palate, and broad acidity extends the finish. Very good indeed. Knappstein is currently looking for a UK listing for the Chainsaw.